Thank you to the really lovely Alisha Valerie for tagging me in the Sweater Weather Tag. You can read Alisha Valerie’s answers over on her blog. I love doing these tags, as I learn a lot about other bloggers and hopefully they learn about me. As you may know, Yankee Candle are my favourite brand of candle. I’m completely addicted. It’s so hard to pick one as I love so many of the Winter/Christmas scents but if I had to pick one, Christmas Eve or Fireside Treats are adorable. I really dislike coffee. I have to be in a certain mood for tea, which I drink with soya milk. Hot chocolate though! Mmmm. So yum. I love it each year when Sheffield is covered in Christmas lights and town has such a festive feel to it! It seems to start early in mid-November. I look forward to it every single year. 4. Which make up trend do you prefer: dark lips or winged eye liner? Winged eye liner, I wish I could master it myself. I like really flowery/summery scents, which I wear all year. Although I have discovered some Zara perfumes recently which are more suited to autumn – thanks to Brogan! We don’t celebrate Thanksgiving here in the UK, or I don’t anyway. However, I love glazed carrots. I’m not really a fan of turkey. The air is crisp but fresh. The leaves turn from green to brown/orange and fall from the trees. It gets darker so much earlier, I love getting straight into my PJs when I get home and putting the heating on to keep warm. I have a bat one which I wear around Halloween. 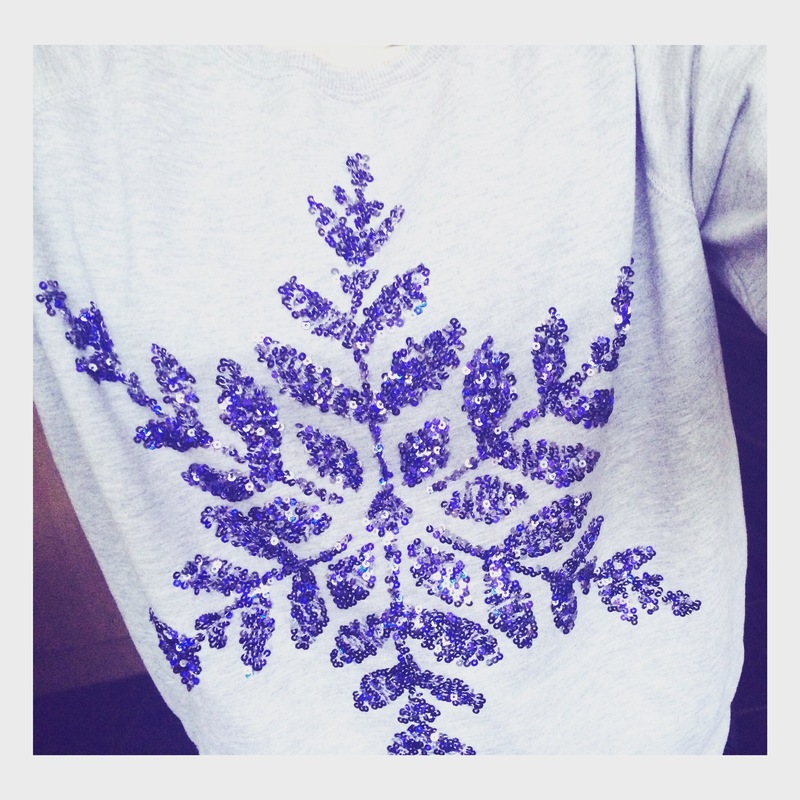 My mum also gave me the jumper you can see in this post with a blue sequin snowflake on it. I wear a lot of silvers/golds on my nails, with glitter on top. Jumping in leaf piles – duh! Leggings, of course. Sometimes I wear tights underneath to make them warmer. I also own fleece-lined leggings which are so snug. I haven’t worn uggs in years, so I’d have to say combat boots. Don’t get me wrong – it’s nice and very festive, but I much prefer mint hot chocolate at this time of year. 14. Favourite fall TV show? I love reality TV shows such as Made In Chelsea. I like to see how the cast dress for the weather. 15. What song really gets you into the fall spirit? I don’t think I have one if I’m honest! I have started listening to Christmas songs though haha. Thank you again to the wonderful Alisha Valerie who tagged me. I would like to tag the beautiful ladies who are; Jess, Becky, Tarnya and anyone else who’d like to complete this. Please do tweet me or comment below to let me know if/when you complete this tag post. I’m looking forward to reading your answers! "Christmas at The Body Shop UK – Meadowhall"
Just came across your blog when looking for some Blogmas ideas and thought this would be lovely to start me off because I only decided to start it about an hour ago. Gave you a little mention on the post. You’ve got a lovely little blog here.